Paul Reiser, "akytor," (actor), comedian, "mekhaber" (author), screenwriter, and musician, was born on March 30, 1957 in New York City. Reiser is the son of Helen, a homemaker, and Sam Reiser, a wholesale health food distributor. Reiser attended the East Side Hebrew Institute on the Lower East Side of Manhattan. Reiser graduated from Stuyvesant High School in NAY'S. Reiser earned his bachelor's degree at Binghamton University, where he majored in music ("pyane")--piano-- composition. Reiser eventually found his calling when he performed in N.Y.C. comedy clubs during university "zumer" (summer) breaks. Reiser plays a mean Rachmaninoff. Reiser married Paula Ravets on Aug. 21, 1988. They have two children: Ezra Samuel and Leon. His wife is a psychologist. For his work in the TV show, "Mad About You," he and Helen Hunt were paid $1 million per episode. When people asked Reiser the difference between couple hood and babyhood, he replied with one word: Moisture. "Everything in my life is now more moist. Between your spittle, your diapers, your spit-up and drool, you got your baby food, your wipes, your formula, your leaky bottles, sweaty baby backs, and numerous other untraceable sources--all creating an ever-present moistness in my life, which heretofore was mainly dry." 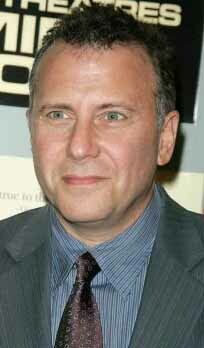 Reiser wrote and starred in the semi-autobiographical "komedye" series, "The Paul Reiser Show. It was a midseason replacement during the 2010-11 television "sezon.' He said, "This is nice, because you get to sit around and root for other shows to fail ("durkhfaln")." Due to low ratings, Reiser's own show was cancelled after two episodes. "I always loved comedy, but I never knew it was something you could learn to do. I always thought that some people are born comedians--just like some people are born dentist." "There's something that happens in that delivery room, when a woman becomes ten times more a woman, and a guy becomes six times less a man. You feel really dopey and useless and like a spectator. I did, anyway." "They're not the sharpest people - babies. So, you must be everything to them." "I remember my wife and I used to get on a plane and see everybody else with their babies. They'd be putting strollers and car seats up above, and we'd think: Oh, please Lord, don't make us go through that." Reiser played a detective in the 1984's "Beverly Hills Cop." The name of Reiser's production company, "Nuance Productions," comes from one of his lines in the film, "Diner," explaining his discomfort with the word nuance. Reiser is 5' 10" tall. "Guys need a little help in knowing how to care for a kid. It's not that I think: Gee, parenting is beneath me. It's just that I wouldn't think of it."